I used to be an avid beer drinker until migraines kept coming up as a result of drinking most beers and ales. Until I found little creatures. They are simply like no other beer or ale that I have tasted and not only that, I no longer get migraines from drinking this particular ale! The taste is so light and pleasant that if it were not for the 5.2% alcohol content, I would happily keep drinking until I ran out the stuff! Thank you to the guys who brewed this stuff!!! This is the finest pale ale I have ever tasted anywhere in the world in over 37 years of global beer consuming. 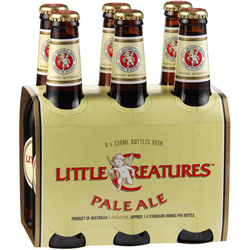 Little Creatures Pale Ale is quite simply the best Pale Ale in the world. It has all the characteristics of a fine Pale Ale, such as refreshing citrus flavours with a good hoppy bite to the finish. But unlike most Pale Ales, it has a good and strong body which holds it all together. You won't buy better!